As we enter the final week of domestic action, the picture is becoming a little bit clearer in both the Premier and First Divisions of the Airtricity League. WITH JUST TWO games left to play, Sligo’s sole concern on Friday night was to keep the league alive by taking all three points away from Dalymount. It took just over an hour for Paul Cook’s men to make the breakthrough and, when they finally did, it came courtesy of a gift from Bohs’ Liam Burns whose underhit backpass allowed Eoin Doyle to nip in and score. Doyle went on to double the advantage six minutes later before Matthew Blinkhorn topped off the win 15 minutes from time. Barring a huge goal difference swing, the win essentially guarantees second place for the Bit O’Red. With UCD to play at home on the final day of the season, they’ll be hoping that either the Students or Galway United can take some points off Shamrock Rovers and leave the door ajar for a final day title surprise. With an eye-and-a-half on their final two league matches, Shamrock Rovers gave an excellent account of themselves on Thursday evening, losing 2-1 to PAOK in their third Europa League group game. Again, it was another encouraging performance by the Hoops and they may fancy themselves to grab a point somewhere over the next two months. For now though, the retention of their domestic title is the only goal in focus. The postponement of this evening’s game against UCD may work in their favour, allowing them an extra day’s recovery from their travels, but Rovers will still be without key men Gary Twigg, Billy Dennehy and Chris Turner if the game does go ahead tomorrow night. Despite a few goal-heavy victories against the Students earlier in the season, Michael O’Neill will surely send his side out without any sense of entitlement. Rovers remain masters of their own destiny, but tired legs and late-season jitters for all sides across the board means there could be a twist or two in the tale yet. The top three placings aside, last Friday’s results have cemented the final standings in the Airtricity League Premier Division for this season. Sligo’s 3-0 win over Bohemians means that Pat Fenlon’s men will have to settle for fifth place behind St. Pat’s, while Bray, Dundalk, UCD and Drogheda occupy positions six through to nine. The revamped promotion/relegation structure ahead of the switch to a 12-team Premier Division next season means that there will be no automatic relegation from the top flight this year. Instead, despite having won just once all season, bottom club Galway United will have a chance to stay up in a two-legged playoff against the team which finishes third in Division One. The games will be played on 1 and 4 November. After springing a shock in their FAI Cup semi-final against St Pat’s earlier in the week, Shelbourne took another giant step towards automatic promotion with a 4-1 win away to Salthill Devon on Saturday night. Two goals apiece from David Cassidy and Philly Hughes left Shels knowing that four points from their final two games will wrap up the First Division title. Alan Matthews will target tomorrow night’s game at home to Finn Harps as an unmissable opportunity to bag three points ahead of the visit of contenders Cork City on Friday night. Harps have won only three times on the road all season and are currently languishing in ninth place. Four contenders, two automatic promotion places, one playoff spot — the maths simply don’t add up. Of those at the top of the First Division, only Cork have guaranteed that they will definitely finish in the top three. As things stand, either Shelbourne or Monaghan could still conceivably finish empty-handed while Limerick know that a playoff spot is as far as their ambition can realistically stretch at this late stage. And so Friday night is set up to be a cracker. Cork travel to Tolka Park for a winner-take-all league decider against Shels, Monaghan head to Athlone, and Limerick host Waterford. Monaghan will expect to continue their 100% record against Athlone and so, barring a disaster for Shels against Finn Harps tomorrow, it looks likely to be Cork, Shels and Monaghan in the top three spots; in what order, though, remains anybody’s guess. Poll: Is Katie Taylor the greatest Irish sportsperson ever? Email “Barstooler: Five things we learned from this weekend's League of Ireland action”. 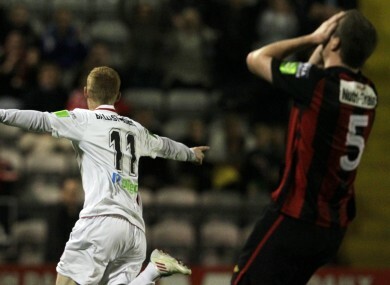 Feedback on “Barstooler: Five things we learned from this weekend's League of Ireland action”.